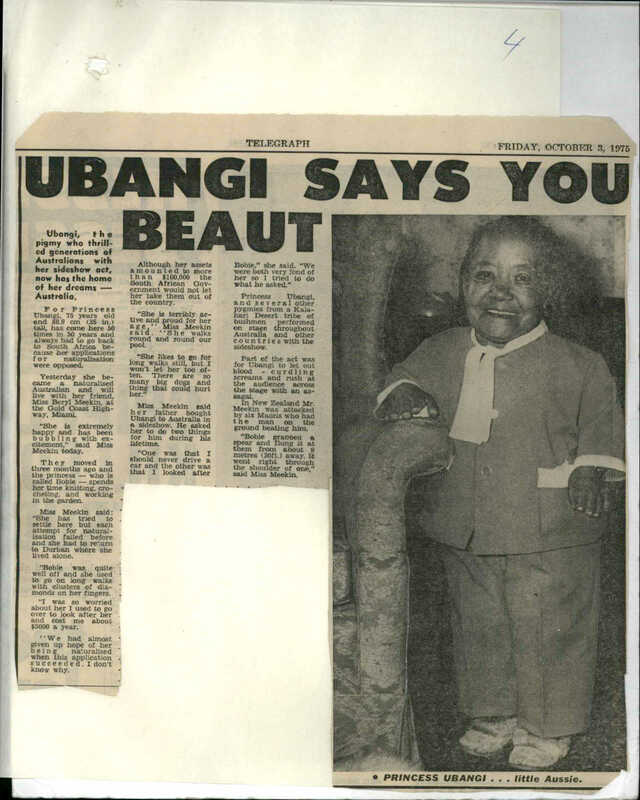 Born in 1901 and standing 88.9cm tall, Maria Peters was variously known as ‘Princess Ubangi’, ‘a tiny killer from the Congo’ and the leader of a pygmy cannibal tribe from French Equatorial Guinea. In truth, Maria was an ordinary South African woman with dwarfism. It is estimated that from the 1930s to the 1960s she travelled to Australia up to 50 times to be ‘exhibited’ at agricultural fairs as part of a group of ‘pygmies’. The group was assembled and managed by entrepreneur Dave Meekin and passed to the management of his daughter Beryl after his death. Although Maria was a British Citizen, she was ‘coloured’ and thus subject to the restrictions of the ‘White Australia policy’. 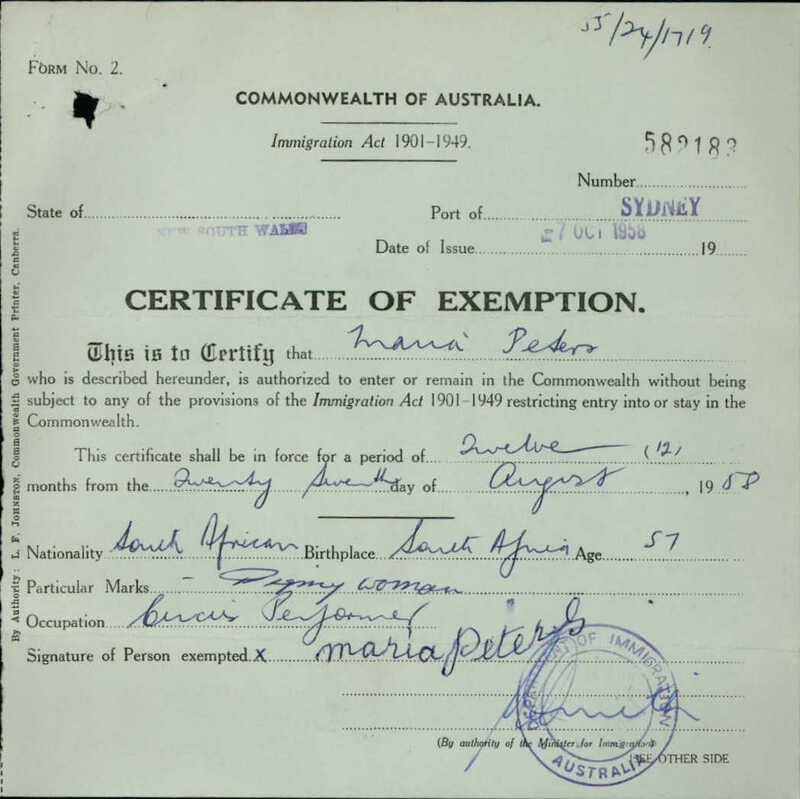 Each time she and her colleagues entered Australia, Meekin had to apply for an exemption for Maria from the restrictions of the Immigration Act 1901-1949. 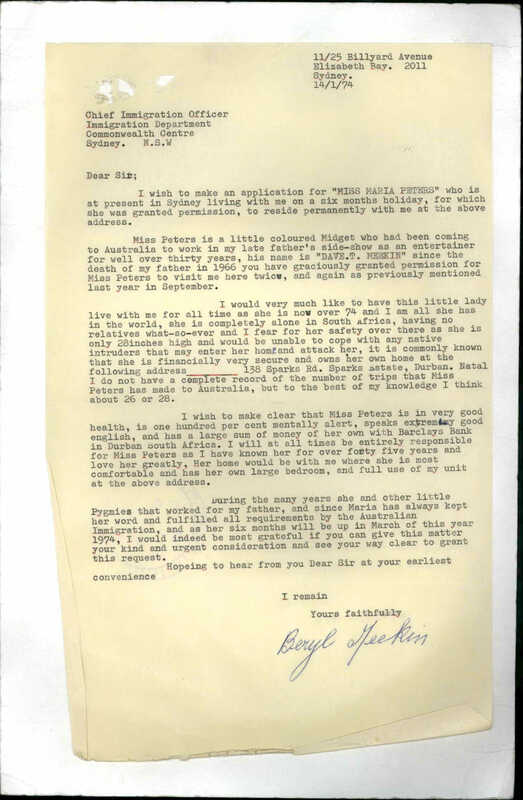 Meekin’s correspondence with the Immigration Department demonstrates the attitudes of the day towards people with dwarfism and dark skin. 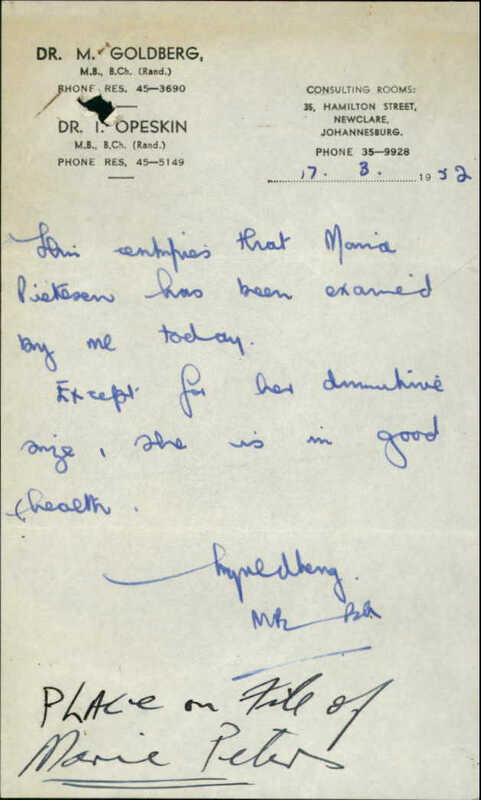 In one letter, when Maria was 53 years old, Meekin described her and her colleagues as ‘well-behaved and fascinating little people.’ Despite his patronising language and his career exhibiting Maria as an exotic curiosity, Meekin and his daughter Beryl developed a sincere and long lasting friendship with her. After Maria’s retirement in the 1960s, she made several trips to Australia from her home in Durban to stay with Beryl for months at a time. 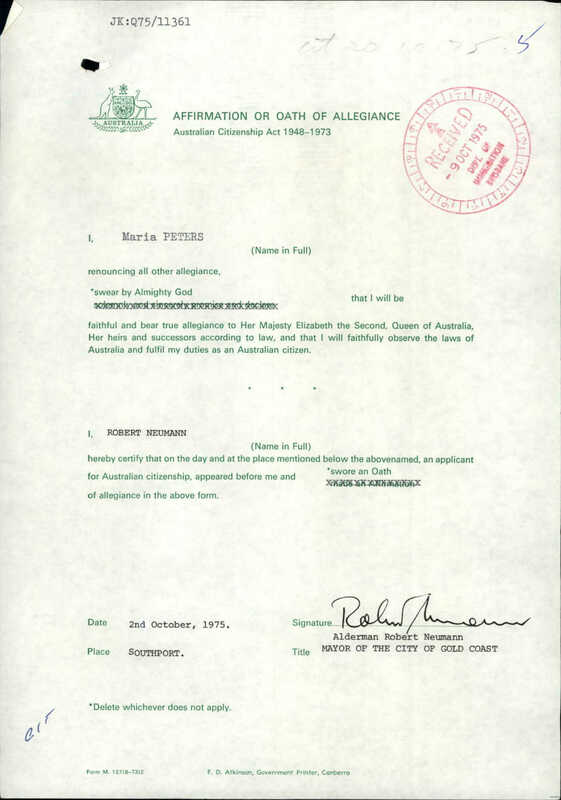 Maria was finally granted permanent residence (1974), then citizenship by naturalisation (1975) in Australia. 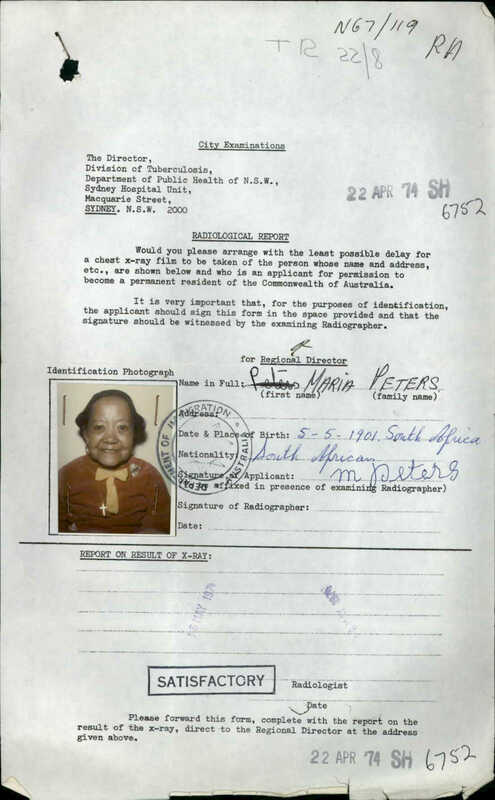 The medical examination for her application for permanent residence stated that Maria should be rejected because of her dwarfism (people with a disability were deemed less desirable as migrants) except that she demonstrated physical and mental abilities ‘of a normal standard for her age.’ Maria continued to live an active, happy life with Beryl Meekin until her death in the early 1980s.